23.11.1903: Launched by Cook, Welton & Gemmell, Hull (Yd.No.357) for Thomas Hamling & Co Ltd, Hull as St. CLAIR. 1.1.1904: Registered at Hull (H803). 1.1904: Completed (John Robinson, manager). 9.4.1904: On a trip (Sk. Hambling). Stood by wooden full rigged ship SIGRID (1003grt/1865) (Capt Carl Gabrielsen) dismasted off Westray, Orkney on passage Trondheim – Mobile. Master declined tow. 11.4.1904: SIGRID foundered 8 miles NW by W of Noup Head, Westray, Orkney. Crew taken onboard and landed in Orkney. Capt Gabrielsen later charged with sinking the ship with criminal intent. 1913: Harold Hall appointed manager. 1.1.1914: Tonnage altered to 102.74net under provision of Merchant Shipping Act 1907. 28.8.1914: Arrived Hull from fishing grounds with the dead body of the engineer and four crew members of the Buckie drifter BARLEY RIG (BCK145) which had been picked up the previous day from a small boat off Blyth. The BARLEY RIG with a crew of nine had been mined of the NE coast and they had been five hours in the boat. 8.1915: Requisitioned for war service as a minesweeper (1-6pdr, 1-3pdr) (Ad.No.296). Based Aegean Sea. 1919: Returned to owner at Hull. 2.10.1924: Sold to Dinas Steam Trawling Co Ltd (64/64), Fleetwood (Joseph A. Marr, manager). 6.10.1924: Registered at Fleetwood (FD15). 23.6.1935: Arrived Oban with boiler trouble and repairs undertaken. 1936: Joseph A. Marr, Jnr appointed manager. 3.10.1936: Vessel mortgaged (64/64) to William Deacons Bank Ltd, London (A). 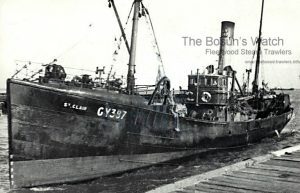 Pre 8.1938: Laid up at Fleetwood. 13.6.1940: Requisitioned for war service and fitted out at Barry as a minesweeper (P.No.FY.1876) (Hire rate £63.15.0d/month). 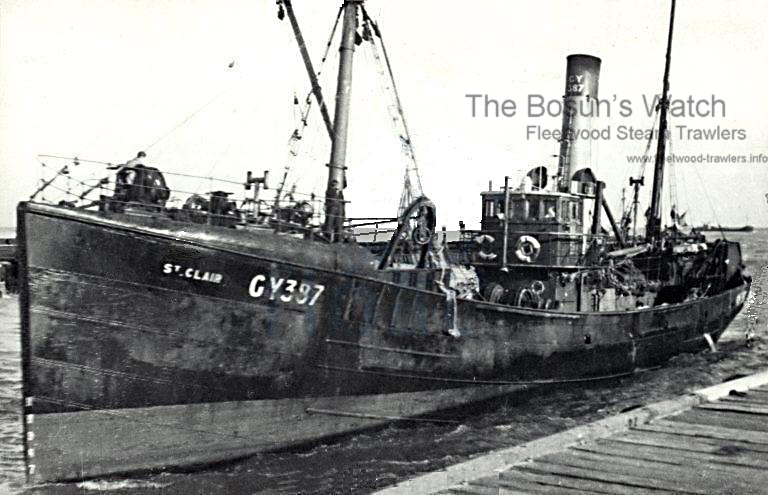 1942: Sold to Northern Trawlers Ltd (64/64), Grimsby. William Alfred Bennett appointed manager. 5.1945: Returned to owner. Reverted to St. CLAIR (FD15). 26.11.46: Registered at Grimsby (GY387). 23.1.1948: Alteration to tonnage and other particulars. Certificate of Survey at West Hartlepool dated 9.5.1947. 246.72grt 93.75net. 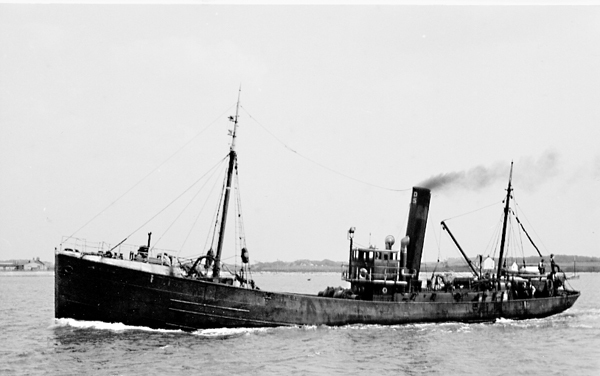 10.5.1948: Sold to Associated Trawlers (Gt. Yarmouth) Ltd (64/64), Great Yarmouth. 18.5.1948: Albert Edward Bewley, Gorleston appointed manager. 31.5.1948: Vessel mortgaged (64/64) to Midland Bank Ltd, London (A). 20.1.1949: Vessel mortgaged (64/64) to Barclays Bank Ltd, London (B). 11.8.1949: Sailed Yarmouth for West of Scotland grounds (Sk.Frederick Thomsett). 23.8.1949: Homeward to Gt. Yarmouth with a good catch, in thick fog in the Pentland Firth stranded on Isle of Stroma. Refloated but wind and tide carried across the Firth, grounding on rocks off Island of Swona; all crew taken off by lifeboat. 28.8.1949: Wreck declared a total loss and later sold to local company for breaking up in situ. 17.4.1950: Grimsby registry closed “Vessel foundered 23.8.1949”. 24/01/2009: Page published. 4 revisions since then. 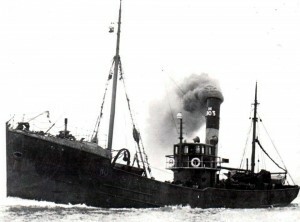 This entry was posted in Lost Vessels, Steam Trawlers, Steamers (Picture) and tagged Dinas, Lost on January 24, 2009 by Fred Smith.